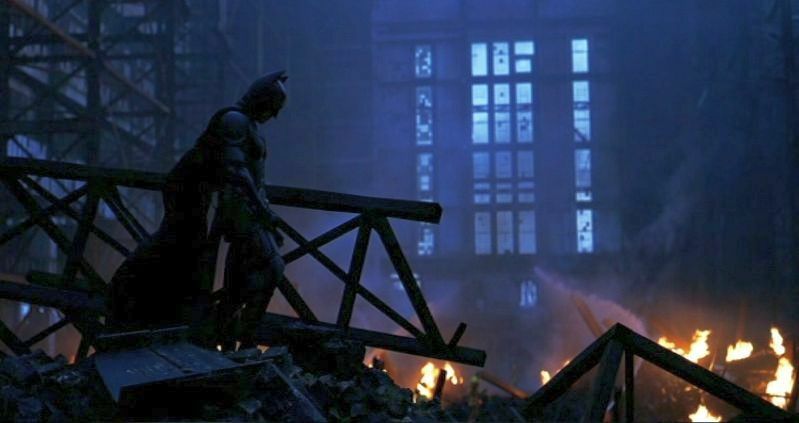 The Dark Knight (2008) has been both a huge critical success and enormously popular at the box office, having earned more than $1 billion worldwide. Directed and co-scripted by the still relatively youthful Christopher Nolan (Memento, 2000; The Prestige, 2006; and Inception, 2010), it is the second part of Nolan’s Batman trilogy, which began with Batman Begins (2005) and will conclude with the upcoming The Dark Knights Rises. Normally a film with such a level of popularity, such as many of the films by Alfred Hitchcock, has a more or less universally compelling narrative that grips its breathless audience to see just how the story will unfold. However, I don’t believe this is the case with The Dark Knight, so the secrets of its success must lie in other domains. The Batman mythology has been continuously popular in the United States since its 1939 introduction in the comic book medium, and there have been numerous films and television series in the intervening years, notably Tim Burton’s noirish film Batman (1989) and the artistically crafted TV series Batman, the Animated Series (1992). Part of this lasting popularity arises from the colorful villains that have been Batman’s nemeses – a set of twisted underworld characters with bizarre appearances and habits. This and the generally nocturnal underworld settings conjure up some elements of film noir, a brooding, existentialist genre where the principal characters have troubled, questionable backgrounds and no discernible futures. Indeed both the 1989 Batman and Batman, the Animated Series were successful precisely because of their exaggerated exploitation of film noir atmospherics. But The Dark Knight doesn’t have that kind of evocation, and I would not classify this film as a film noir. Returning to the subject of the Batman story’s characteristically colorful villains, I would say that one of the most disturbing (and hence fascinating) depictions in this realm was Jack Nicholson’s characterization of “The Joker” in the 1989 Batman – disturbing because although one would expect the The Joker to be absurdly ludicrous, one wouldn’t expect this villain to be so threatening. Nicholson’s characterization of The Joker, though, evoked something very dark, almost apocalyptic behind that freakish smile. In Nolan’s The Dark Knight, The Joker is again the malefactor, and I suspect that Nolan was inspired or influenced by that earlier work and intended to summon up similar shudders of horror that Nicholson had evoked. But I don’t think he succeeded in that particular area of characterization, either. Anyway, let’s consider the story of The Dark Knight, and what if has to offer. Even though this is the second installment of a trilogy, the film should stand on its own as a narrative and not require the viewer to know everything about the previous Batman Begins. There are five principal characters in this story. Batman, who in everyday life is Bruce Wayne (played by Christian Bale). Although we are basically familiar with this character from popular culture, the character of Bruce Wayne doesn’t have much definition in this film. And when he is dressed up as Batman, he seems to be someone else altogether. Harvey Dent (Aaron Eckart). He is the Gotham City district attorney and Batman’s ally, although a romantic rival for the attentions of Rachel Dawes. Dent is an idealistic type, but again, we have a comic-book level of depth to the characterization. When a horrific event turns Dent into Two-Face, there seems to be no connection with his previous character. Rachel Dawes (Maggie Gyllenhaal). Wayne’s childhood friend and now an assistant district attorney, Dawes represents the feminine pole of romantic attraction. But in this film she doesn’t have much to do other than to dither for awhile between choosing Dent or Wayne. The Joker (Heath Ledger). Here is the dark force of chaos, but Nolan errs by giving The Joker too much screen time. All that we can get out of this character is that he is sadistic and bent on nonstop destruction. But the more we see of the slavering Heath Ledger, the more mundane and merely contemptible (as opposed to other-worldly demonic) he becomes. Lieutenant Jim Gordon (Gary Oldman). He is the good cop, and the only human and believable character in the story, thus making him, from my perspective, the real hero of this film instead of Batman. Although the story plays out primarily as an extended series of violent encounters between Batman and his enemies, one might partition these encounters into five general headings. 1. The Setup – some establishing sequences outlining the power balance that will dominate the rest of the film. The Joker and his gang of thugs rob a bank. Along the way, The Joker casually kills off all of his gang so that he doesn’t have to split up the loot. Police lieutenant Jim Gordon and Batman decided to include new District Attorney Harvey Dent into their schemes to thwart the crime Mob of Gotham City, which is dominated by three gangsters: Gambol, Maroni, and The Chechen. At a meeting of the Mob leaders, a Chinese Mob accountant, Lau, informs them that he had securely hidden their ill-gotten funds offshore in Hong Kong. The Joker breaks into the meeting and offers to bump off Batman, but he is rebuffed. The Joker then kills Gambol and takes over his gang. Batman later captures Lau overseas and delivers him back to Gotham City. Lau will soon be of no consequence, and one wonders why there was much interest in him in the first place. The Joker wants the identity of Batman to be revealed and begins assassinating city officials. First the police commissioner and an anti-crime judge are killed, with DA Dent the next named target. 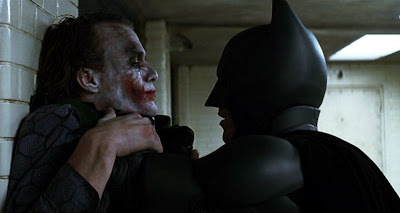 When The Joker tries to kill the mayor, Lt. Gordon saves him and pretends to be killed in the process. 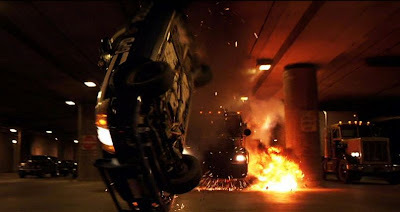 Dent is whisked away in a police van, but with The Joker and his thugs in hot pursuit, there is a lengthy, violent gun battle on the city streets which eventuates in The Joker’s capture. Even with The Joker in jail, he manages to have Dent and Rachel captured and scheduled to be blown up simultaneously in separate locations. 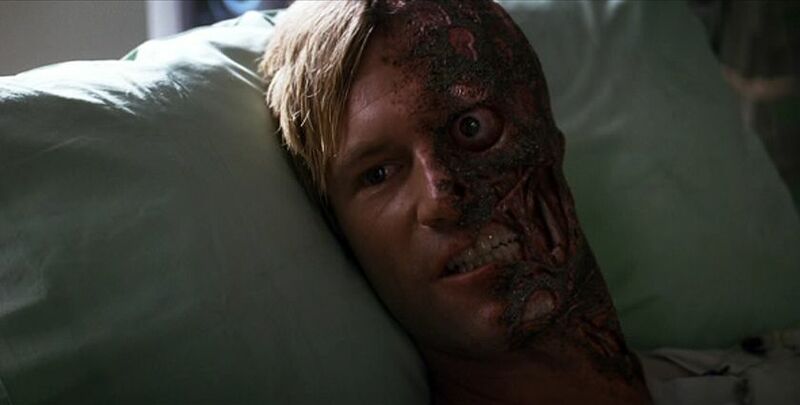 Batman makes an effort at rescuing, them, but Rachel is killed in the explosion at her location, and Dent has half of his face burned off, turning him into the psychopath, Two-Face. Then The Joker uses more bombs to escape from the police jail. With The Joker now loose, he unleashes further mayhem on the city by threatening to bomb a hospital. The Joker goes on to visit the mutilated Dent/Two-Face in the city hospital and convinces him to go out and become a vengeful killer. As The Joker departs the hospital he has it blown to pieces. Then The Joker has two city ferries rigged with radio-wired explosives such that each ferry can trigger the destruction of the other. He instructs the passengers that unless one of the ferries chooses to annihilate its pair by midnight, he will have them both blown up. 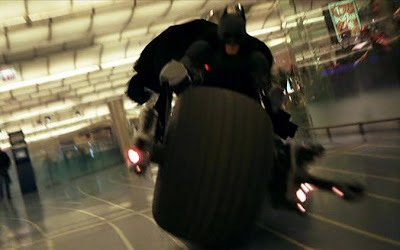 However, Batman, aided by a massive sonar-fed supercomputer, finds The Joker and captures him in the nick of time. So The Dark Knight just consists of an extensive sequence of hyper-violent encounters between Batman and a sadistic maniac, The Joker. But though there is lots of action, there is little dramatic progression to this sequence. Admittedly the violent sequences are staged with top-level special effects and are visually kinetic to the highest degree. But the dramatic tension and buildup to these scenes is missing; so it’s more like a theme-park roller coaster ride than a drama. Looking further at the dramatic elements, there are additional problems. The character dual between Batman and The Joker is less interesting than one might expect. Batman, at least when he has donned his Batman suit, appears to be a mindless growling brute. He relies on high-tech equipment that has been supplied to him by Wayne Enterprises, but he himself seems to have no plan, no strategy. He relies on brute force, and much of the time he just uses his fists to beat up the various villains that he encounters. The Joker, in contrast, though he claims to have no plan and perhaps no overall strategy, certainly has detailed tactics. He seems to be mentally one step ahead of Batman at every turn. As a moral tale, The Dark Knight is equally benighted. It is true that Batman refuses to kill, but he is essentially an angry, emotional thug. His adversary, The Joker, is also uninteresting, because his character is completely opaque and therefore unmotivated. Too much screen time is wasted showing his slavering grimaces, which merely make him mundane. In this vein, it interesting to compare and contrast two other films: Ridley Scott’s Alien (1979) and James Cameron’s narratively inferior Aliens (1986). In Alien, the invasive monster is a rarely seen shape-shifter, which renders it all the more fearful. As we watch Alien, our imaginations struggle to fathom the compass and scope of this monster, and therefore we become effectively paralyzed in fear. In Cameron’s Aliens, however, the monster is a huge, noisy brute, but it lacks the mysterious cosmic dimensions of Scott’s monster. Nolan makes the same mistake in The Dark Knight by showing too much of The Joker’s talking and whining and thereby trivializing him. Indeed one might compare Christopher Nolan to both James Cameron and Steven Spielberg. All of them are cinematic architects – they tend to craft vast, awe-inspiring cinematic environments that overwhelm the viewer with their oppressive intensity. But these same directors often fail to craft the compelling narratives that are needed to operate inside those atmospheric environments and that can fire our imaginations.